The cool thing about GPS is to know where you are ... but what use does it make without a map showing you where that might be? The great thing about an iPAQ is that it has a lot of memory, most of them have a colorscreen and best of all they have sound on board. So combing this, for example with the TomTom Navigator or TeleType GPS software, would make an excellent navigation tool ... wouldn't it? Ehm,... but how should we connect them? Well, let me show you how I connected my Compaq/HP iPAQ 3630 to my Garmin eTrex Venture. The iPAQ 3630 (Any 3600 and 3800 series will do) can be bought pretty cheap at for example eBay.com or Marktplaats.nl. The GPS receiver, a Garmin eTrex, can be bought for app. $100 (basic model) to $170 (the Venture model which has just that little bit of extra, and comes with a serial cable too! See also: GPSNow). OPTION A: Modify a cable to become a nullmodem cable for the iPAQ. This is most likely the easiest way to go. However it assumes you have a iPAQ connector. We basically make a serialcable for the iPAQ modified to nullmodem cable. OPTION B: Create a specific cable. More conveniant in use, but not easier to get by the proper part. One needs a specific Garmin eTrex connector (see PC-Mobile who carry these for a decent price). This trick assumes a Compaq/HP iPAQ 3600 (or 3800) series PDA and a Garmin eTrex GPS receiver (any model will do). The connector would be sufficient too, but since these are rare and pretty expensive, I opt for the re-use of my serial cable. My Garmin eTrex Venture came with a suitable cable. I got mine from a $5 USB to iPAQ cable. I used the USB cable for the serial craddle to USB trick. The connector of the iPAQ was not used for that ... keep in mind though that if you use a cable that this connector should be detachable - ie. not molded to the cable! A Serial to iPAQ cable would make things even easier. In that case rather go to a shop and find yourself an nulmodem adapter (male DB9 on both sides). So how are the wires connected then? Connect the 3 wires with the connectors as indicated in the table above. Below you will find detailed images on the pins to use. Keep in mind that this cable is for GPS only! And this cable is a NULMODEM cable! Other equipment might need more cables to put through! As always, connectors have numbered pins,... the only things is: WHAT numbers? Most DB9 connectors have number printed on them, but the iPAQ connector is too small for that. So I tried to make it better understandable which is which. 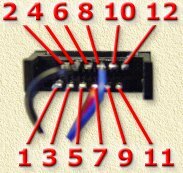 This is a well known and well document connector, most of them even have numbering on the connector itself. Tip: If you're busy with an eTrex connector anyways then you might want to consider adding external power for the eTrex aswell. Use a 3V powersupply and connect it to pin 1 (+) and 4 (-) of eTrex connector.